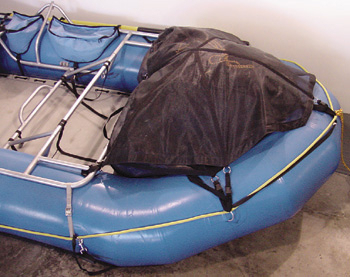 We have attached cam buckle straps to the rings sewn onto the middle and top of the bag, to make it even easier to solidly secure this bag in the cavity of your raft and to hold it there, even if the raft flips! We designed this bag to take the drudgery out of loading and unloading dry bags and gear on long rafting trips. A 16' drawrope bag closes around the gear. The 65" wide/48" front-to-back lid clamps down over the drawrope bag top. The mesh from our 476/44 Cargo Floor serves as the bottom of the bag (44"wide/38" front-to-back).